If there is a Guinness Book of World Records entry for most threats issued with no follow up, the international community’s response to Darfur is likely setting a new standard. Barking without biting is the diplomatic equivalent of giving comfort to the enemy. In the case of Darfur, it may be even worse. Each time during the past three years that the Bush administration or the UN Security Council has threatened the Government of Sudan but failed to take action, the Khartoum regime has been emboldened to escalate its destruction and obstruction in Darfur. Its past practices make clear that the regime no longer takes these threats seriously, and will continue to flout international opinion until there are specific and escalating costs to its actions. When the lessons of this regime's behavior are taken into account, the answers become clear and obvious. Continuing to ignore these historical precedents may condemn hundreds of thousands of Darfurians to death. an effective civilian protection force, the starting point for which is the "hybrid" AU-UN force mandated by the international community but rejected by Khartoum. There is ongoing debate about how to secure those two critical peace and protection objectives, the first two “P’s” of what ENOUGH, a joint initiative of the International Crisis Group and the Center for American Progress to abolish genocide and mass atrocities, calls the "3 P's" of crisis response. The third P is punishment: imposing a cost for the commission of mass atrocities and building leverage through these measures for securing the peace and protection objectives. Setting a firm deadline triggering meaningful and timely action is crucial. Last month, the U.S. accepted UN Secretary General Ban Ki-Moon’s appeal to delay U.S. and UN Security Council sanctions in order to give diplomacy more time, and the administration indicated that Khartoum would be given two to four weeks following the Secretary General’s April 2 request. A month has now passed, and, as demonstrated by recent attacks by helicopter gun ships and a build-up of Janjaweed forces in West Darfur, Khartoum continues to pursue a military solution. Though further delay is abhorrent, there is a silver lining. The Bush administration's current Plan B — the measures that President Bush was going to announce during his April 18 speech at the U.S. Holocaust Memorial Museum but then delayed in order to give diplomacy more time — is inadequate. In delaying implementation, theadministration has given itself time to prepare a real Plan B — a set of punitive measures with teeth. 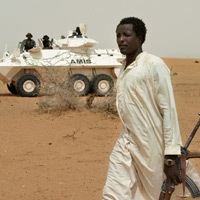 Further, it gives U.S. diplomats time to use the U.S.' month-long chairmanship of the UN Security Council (May 2007) to move Darfur high on the Council’s agenda and coordinate Plan B efforts with the European Union (which has indicated that its own Plan B sanctions could go into effect as early as June) and other international actors willing to impose a cost on the regime for itsactions. On May 18, one month after the President’s initial speech, the White House should announce a revised set of Plan B measures and allocate sufficient resources to implement them swiftly and effectively. One month is a fair amount of time after President Bush’s speech to see whether the UN Secretary General’s diplomatic efforts will have had effect. If not, then the U.S. should impose Plan B on that date and work with allies to make Plan B as multilateral as possible. Most of the measures the administration was prepared to announce in April lack clear and decisive plans for implementation, are too unilateral in nature, and are too weak to have a major impact on the calculations of either regime officials in Khartoum or on intransigent rebel leaders. After ten years of dealing with unilateral U.S. sanctions, the Sudanese government and its commercial partners have by now figured out how to circumvent any additional U.S. measures. The U.S. has been blocking many Sudanese transactions since President Clinton imposed sanctions in 1997, and the Sudanese regime has had ten years to prepare for the next round. A new Sudanese oil industry has grown up around these sanctions, and the oil business is conducted without interference because this new sector is beyond the scope of existing U.S. sanctions. Though the oil industry has grown to dominate Sudan’s economy, the U.S. has little understanding of its operations, and has not committed the resources to collect such information. Perhaps most damning, because the administration has for five months leaked information to the press about Plan B, the regime has had ample time to develop a plan for working around new, additional sanctions. The United States cannot realistically impose robust sanctions on Khartoum unless and until it has enough information about how Sudanese business is conducted to prevent Khartoum from hiding its transactions. The U.S. should therefore undertake an “intelligence surge” by the CIA to gather detailed and comprehensive information on Sudanese companies with financial ties to the NCP and on individuals responsible for atrocities that have been or are being committed in Darfur. The U.S. should also undertake an “enforcement surge” and ensure that the Treasury Department devotes additional staff and resources to aggressively act on this new information. (As currently constituted, the Department of Treasury’s Office of Foreign Assets Control (OFAC) cannot effectively enforce new sanctions against Khartoum without reducing its focus on other, critical sanctions regimes). Intelligence and enforcement surges could bring the U.S. up to speed on the critical facts and capacities that are needed to effectively implement any punitive measures. And without a clear strategy of rapidly escalating pressure through a variety of economic and legal measures, then the deadly status quo will no doubt prevail. Both of these steps require political leadership and long-term vision. Since the fall of 2001, the U.S. has counted on the cooperation of Khartoum in global counter-terrorism efforts and the administration continues to welcome and work closely with many of the same Sudanese intelligence officials who are responsible for Khartoum’s policies and actions in Darfur. Members of Congress have begun to question seriously the extent of Sudan’s cooperation with the U.S. on counterterrorism matters, but stepping up the practical pressure on Khartoum may well generate opposition in the intelligence community. Similarly, the expansion of economic sanctions — particularly those that affect Sudan’s oil sector — may complicate an already complex relationship between the United States and China. The point is not simply to punish for punishment’s sake, even though America’s signature on Genocide Convention does oblige us to punish the perpetrators of what the U.S. government has repeatedly labeled genocide. Punitive measures are necessary to gain Khartoum’s acceptance of a durable peace deal for Darfur and the deployment of an effective international force to protect civilians. Similar measures should be imposed against leading rebel commanders and political leaders if they are deemed to have committed atrocities or are obstructing real and balanced peace efforts, which so far do not exist. As important as it is that the U.S. act to implement a Plan B with teeth, our ability to leverage action by Khartoum will be exponentially increased if we act multilaterally. The U.S. government already has unilateral sanctions in place against Sudan that bar U.S. companies from doing business in Sudan (though allowing U.S. businesses to work with the Government of South Sudan), and freeze assets in the U.S. or in the control of U.S. citizens of the Sudanese government and certain government-owned Sudanese companies. Enacted in 1997, these sanctions did affect the calculations of the regime in the past, but they have since run their course as the Sudanese regime circumvents U.S. institutions in its commercial dealings. Even more important, however, the fact that existing sanctions are unilateral means that Khartoum has the practical advantage of accessing non-American financial systems and investors, and the political advantage of knowing that the international community is not acting in concert. Punitive measures applied by the international community acting as one will have a much greater impact on the pocketbooks of those responsible for crimes against humanity. Moreover, the Government of Sudan will have a much more difficult time scoring propaganda points when the U.S. is not acting alone. It is therefore critical that the U.S. works with its partners in the UN Security Council and other forums and shares both intelligence and responsibility for enforcement. The following initiatives could be implemented immediately at little cost, but would require a strong diplomatic effort to rally multilateral support and increases in staffing and resources to ensure aggressive implementation. TARGET SUDANESE OFFICIALS MULTILATERALLY: Impose targeted UN Security Council sanctions — including asset freezes and travel bans — against persons responsible for crimes against humanity in Darfur. Such sanctions have been authorized in previous UNSC resolutions, and called for in multiple reports from the UNSC Sanctions Committee Panel of Experts, but they have not actually been imposed on any official of import. The U.S. effort now underway would target only three individuals, one of whom is a rebel leader, in addition to four individuals designated in 2006, only one of whom is a regime official. The number must be much higher and be widened with each atrocity perpetrated, and reflect the reality of Khartoum’s complicity in genocide. Three senior Sudanese officials in particular must be singled out for sanctions: Assistant to the President Nafie Ali Nafie; Director of National Intelligence Salah Abdallah Abu Digin (AKA Salah Gosh); and Minster of Defense Abdel Rahim Mohamed Hussein. These three officials maintain a tight grip on Sudan’s labyrinthine security apparatus and continue to drive policy and military operations in Darfur. TARGET SUDANESE COMPANIES MULTILATERALLY: Impose UN Security Council sanctions against the Sudanese companies already targeted unilaterally by the U.S., and establish a UN Panel of Experts to further investigate which companies are conducting the business necessary to underwrite Sudan’s war machine. If, ultimately the U.S. imposes unilateral sanctions on 29 more companies, this would bring the total number of companies the U.S. has unilaterally sanctioned to 159. Unless these sanctions are multilateral they will largely be meaningless, so the U.S. should lead efforts in the UN Security Council to sanction multilaterally the full panoply of 159 companies. PRESS INTERNATIONAL BANKS TO STOP DOING BUSINESS WITH SUDAN: As is the case with Iran, U.S. officials should engage with a number of international banking institutions to strongly encourage them to stop supporting oil transactions with Sudan, with the implication being that if such business continues then all transactions by those banks with U.S. commercial entities (and those of other countries willing to work with us) would eventually be banned. All efforts should be made to shield the Government of Southern Sudan from negative impacts from such an initiative. This wouldn’t necessarily stop Sudan’s international exchange needs, as money would just be moved through other banking systems over which the U.S. has no access or jurisdiction, but would drive it underground and put another scarlet letter next to Sudan, furthering its isolation and pariah status. REINFORCE DIVESTMENT EFFORTS: President Bush should sign an Executive Order putting into law all of the legally possible elements of existing Congressional bills in support of divestment: the Darfur Accountability and Divestment Act of 2007 (HR 180) and the Sudan Divestment Authorization Act of 2007 (S.831). The executive branch should be supportive of efforts all over the U.S. to pressure university endowments, state and municipal pension funds, and private mutual funds to sell equity holdings in a targeted list of companies doing business with the Sudanese regime. The Sudan Divestment Taskforce (www.sudandivestment.org) maintains an updated list of these so-called “worst offender” companies. SUPPORT THE ICC INDICTMENT PROCESS: Provide information and declassified intelligence to the International Criminal Court to help accelerate the process of building indictments against senior officials in the regime for their role in orchestrating mass atrocities in Darfur. The U.S. has the most such intelligence and should come to agreement with the ICC about what information to share. While the financial and legal aspects of Plan B can be implemented immediately, preparation is also required for the military elements of a Plan B with teeth. If prompt financial and legal measures succeed in altering the calculations of the regime in Khartoum, then there will be no need for these military measures. But as history makes clear, the credible threat of military action will alter the calculations of Khartoum officials. As well, and in the event the regime continues to defy its obligations to its own citizens and the will of the international community, these military actions could help to protect the people of Darfur. Two coercive military measures require accelerated planning processes, which should commence within the NATO framework, but also seek UN Security Council approval. The aim of these military planning efforts would be to maximize the protection of Darfurian civilians and humanitarian operations if the situation continues to deteriorate. No Fly Zone: Absent an enhanced ground component this option is questionable and fraught with potential negative side effects. However, it is important to press ahead with planning an enforcement mechanism for a no-fly zone (NFZ) as the Sudanese regime continues to use aerial bombing as a central component of its military strategy and its civilian displacement objectives. If the mandate of the existing AU force or the planned UN/AU hybrid force would be strengthened and more troops deployed to protect civilians, neutralizing the Sudanese regime’s one tactical advantage will be essential. However, the risk to humanitarian operations posed by an NFZ must be acknowledged and mitigated. It would be irresponsible to move forward with an NFZ in the absence of preparations to deploy ground forces to protect IDP camps and humanitarian operations. Khartoum will perceive an NFZ as an act of war, so planning for a No Fly Zone must also include contingency planning based on possible responses from the Sudanese regime. The consequences could be dire. Posturing without planning could blow up in the faces of the IDPs, refugees, and humanitarian workers bravely assisting them. Non-Consensual Force Deployment: Although few nations are likely to support this and volunteer forces in the present context, if the situation dramatically deteriorates in Darfur (large-scale pullout of humanitarian agencies, increasing attacks on camps or AU forces, etc. ), the debate could shift quickly and credible plans need to be in place to move troops into the theater of war quickly with a primary focus on protecting vulnerable civilian populations. This planning is both a practical necessity, and a means to build and utilize leverage against the regime. The U.S. must move away from its current policy of constructive engagement without leverage to a more muscular policy focused on walking softly and carrying — and using — a bigger stick. Unfulfilled threats and appeals should be replaced quickly with punitive measures backing a robust peace and protection initiative. We may not know the names of the victims in Darfur, but we know the names of the orchestrators of the policy that led to their deaths. There is hope. The growing constituency in the U.S. focused on countering the atrocities in Darfur is expanding by the day. Elected officials who ignore this crescendo of activism — though not usually front page news — do so at their own peril. We will do a great service to all of history’s victims of mass atrocities if we make it politically costly for this administration, or any future one, to stand idly by while Darfur burns. Your elected officials need to hear from you that the current Plan B proposed by President Bush is inadequate. The United States must work multilaterally to impose punitive measures — including targeted sanctions and economic pressures — against senior Sudanese National Congress Party officials and the companies they control. By contacting your elected representatives, you will be joining thousands of concerned activists from across the country in "leading their leaders." ENOUGH urges activist organizations to issue action alerts urging their members to contact the White House, their Senators, and their members of Congress to press for a Plan B with teeth. The Genocide Intervention Network operates a toll free number, 1-800-GENOCIDE that will connect you to your elected officials. to urge President Bush to put credible plans in place for a no-fly zone and non-consensual force deployment to protect civilians if the situation dramatically deteriorates in Darfur. to put credible plans in place for a No-Fly Zone and non-consensual force deployment to protect civilians if the situation dramatically deteriorates in Darfur. John Prendergast is on leave from his International Crisis Group work to help build ENOUGH, which he co-founded. His bestselling book, Not on Our Watch: The Mission to End Genocide in Darfur and Beyond, co authored with actor/activist Don Cheadle, is available at book stores nationwide. Colin Thomas-Jensen is taking leave from Crisis Group work to serve as Policy Adviser to ENOUGH.